1. Williams AD, Cousins C, Souffer WP etal. (2001) Detection of pelvic lymph node metastases in gynaecological malignancy. A comparison of CT, MR imaging and positron emission tomography. AJR 177:343-348. Assesses the relative values ofCT, MRI and PET, with histological correlation, in the detection of pelvic lymph node metastases. 2. Vinicombe SJ, Norman AR, Nicolson V and Husband JE. (1995) Normal pelvic lymph nodes: Evaluation with CT after bipedal lymphangiography. Radiology 194:349-355. Normal lymph node size assessed on CT with lymphangiogram correlation. 3. Kim SH, Kim SC, Choi BI and Han MC. 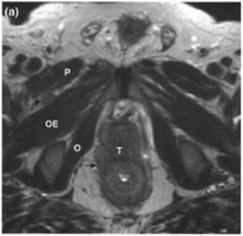 (1994) Uterine cervical carcinoma: evaluation of pelvic lymph node metastases with MR imaging. Radiology 190(3): 807-811. Assesses the accuracy of MRI in the detection of lymph node metastases and confirms that the short axis diameter is more accurate than long axis diameter. 4. Bellin MF, Roy C, Kinkel K etal. (1998) Lymph node metastases: safety and effectiveness of MR imaging with ultrasmall superparamagnetic iron oxide particles- initial clinical experience. Radiology 207:799-808. Confirms safety and usefulness ofSPIO particles in differentiating metastatic from benign lymph nodes. 5. McCauley TR, Rifkin MD and Ledet CA. (2002) Pelvic lymph node visualization with MR imaging using local administration of ultrasmall superparamagnetic iron oxide contrast. J. Magn. Reson. Imaging 15:492-497. Demonstrotes the increased number of lymph nodes detected with local interstitial injection in comparison with intravenous injection. 6. Carrington B. (1998) Lymph nodes. In: Imaging in Oncology (eds Janet ES Husband and Rodney Rezneck). Isis Medical Media Ltd, Oxford, pp. 729-748. Good overview of lymph node metastases and a variety of imaging techniques. 7. Daldrup-Link HE, Franzius C, Link TM etal. (2001) Whole-body MR imaging for detection of bone metastases in children and young adults. AJR 177:229-236. Good comparison of MR, skeletal scintigraphy and PET scanning for the detection of bone metastases. 8. Taoka T, MayrNA, Lee HJ etal. (2001) Factors influencing visualization of vertebral metastases on MR imaging versus bone scintigraphy. AJR 176:1525-1530. Demonstrotes that cortical involvement is the likely cause ofpositive findings on bone scans whereas MR scans may detect very early small intramedullary metastases. Figure 13.1. Normal lymph nodes. (a) Transaxial T2W1 showing two lymph nodes in the right lateral external iliac (straight arrows) and surgical obturator regions (curved arrows), both with a high signal intensity fatty central hilum and an intermediate signal intensity margin. The patient has a large bladder tumour (T) extending to involve the cervix (C). An incidental bone cyst (asterisk) is present in the left acetabulum. External iliac artery (A); external iliac vein (V); obturator internus muscle (O). (b) Transaxial T1W1 showing a nonenlarged lymph node in the left inguinal region (straight arrow). This has an intermediate signal intensity centre with a rim of fatty high signal and an intermediate signal intensity margin, which gives it a typical 'target' appearance. Nodes with this appearance are less likely to be infiltrated with tumour. Note a small right inguinal lymph node (arrowhead) of more uniform intermediate to high signal intensity. Figure 13.2. Normal lymph node appearances on STIR sequences. (a) Transaxial T1W and (b) STIR images demonstrating small bilateral inguinal lymph nodes (arrows) which demonstrate high signal on STIR. (c) Transaxial T2W and (d) STIR images in a different patient demonstrating a right inguinal lymph node (arrows) which is predominantly of fat signal but with some internal structure as shown by chemical shift artifact within the node in (c) (arrowhead). On the STIR image the capsule of the node increases in signal, the fat within the node suppresses and the soft tissue structure becomes evident as small foci of high signal. Figure 13.3. Mucinous rectal carcinoma with perirectal, internal iliac and obturator lymph nodes. Figure 13.4. Paracervical metastatic lymph node in cervical cancer. Figure 13.5. Pre-sacral lymph nodes in rectal carcinoma. 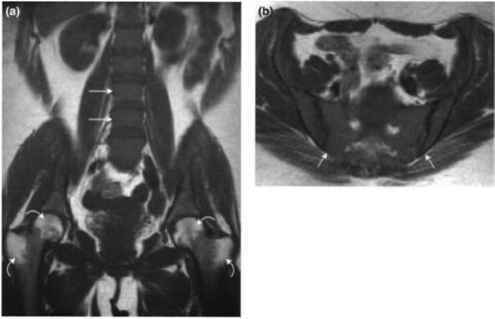 (a) Sagittal and (b) coronal T2W1 demonstrating pre-sacral lymph nodes (straight arrows) which are of abnormal signal similar to that of the primary rectal tumour (T). Pre-sacral nodes are not normally seen therefore their presence, however small, raises the suspicion of metastatic lymph node disease. Sacrum (S); seminal vesicles (SV); prostate (P). Figure 13.6. Prostatic carcinoma with anatomical and surgical obturator lymph nodes. 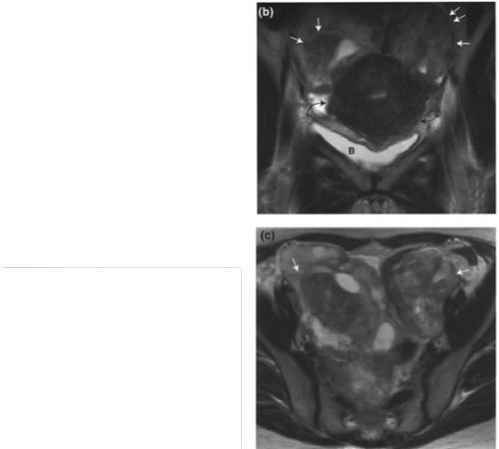 (a) Transaxial and (b) coronal T2W1 demonstrating a prostate tumour (T) with extra-capsular spread (short arrow). There is a right-sided anatomical obturator lymph node (curved arrow in (a)) which is of similar signal to the primary prostatic tumour (T). There are bilateral enlarged right surgical obturator nodes (long arrows in (b)) which have a high signal centre,greater than fat, indicating central necrosis. Obturator internus muscle (O); obturator externus muscle (OE); pectineus muscle (P). Figure 13.7. Common iliac lymph nodes -'filled in fat' sign. Transaxial T1W1 through the proximal common iliac vessels demonstrates enlarged middle/posterior common iliac lymph nodes (arrows) situated behind the iliac vessels filling in the fat and eroding into the sacrum. Compare with the normal left side. Psoas muscle (P); iliac vessels (asterisk). Figure 13.8. Alteration in pattern of lymph node metastases after surgery for bladder cancer. Transaxial T2W1 showing an enlarged right inguinal lymph node (straight arrow) which is as the same signal as the pelvic recurrence of the patient's bladder tumour (T). The usual pattern of lymph node spread from bladder carcinoma is to the paravesical, obturator and external iliac nodes. After cystectomy, altered lymphatic drainage has resulted in the left pelvic recurrence spreading to the right inguinal region. Figure 13.9. Metastatic lymph nodes which are nonenlarged but in the recognised drainage pathway of the primary tumour. (a) Transaxial T2W1 in a patient with cervical cancer demonstrating a nonenlarged left internal iliac lymph node (straight arrow). This is of similar signal intensity to the primary cervical tumour (T) and is highly suspicious of metastatic involvement. (b) Coronal T2W1 in a patient with prostate cancer with nonenlarged lymph nodes in the proximal left external iliac (straight arrow) and both obturator regions (curved arrows). 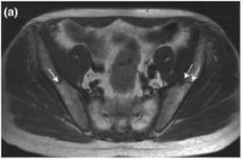 Again, these are of similar signal to the primary prostatic tumour (T). Bladder catheter (asterisk). In these patients, lymph nodes are located in the known drainage pathway of the primary tumour and their signal intensity mirrors the signal intensity of the primary tumour increasing the likelihood of metastatic involvement despite their small size. Figure 13.10. Metastatic lymph nodes—extra-capsular extension of tumour. Transaxial T2W1 showing an enlarged right obturator lymph node (straight arrow), which has an irregular wall indicating likely extra-capsular spread. The signal intensity is also abnormal and similar to that of the primary tumour (T) involving the uterus. A small but asymmetrically prominent right internal iliac lymph node (arrowhead) is also noted. Figure 13.11. Metastatic lymph node—tumour signal. Coronal T2W1 demonstrating an enlarged right obturator node (straight arrows), which has an abnormal signal intensity similar to that of the primary bladder tumour (T). Common iliac artery and vein (C). Figure 13.12. Perirectal and right external iliac nodal metastases with central nodal necrosis. Transaxial T2W1 in a patient with a squamous cell tumour (T) of the cervix showing an enlarged abnormal perirectal lymph node (straight arrow). 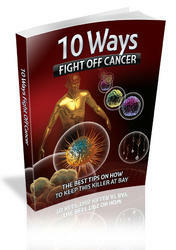 It is of similar signal intensity to the cervical tumour. There is also an enlarged right internal iliac lymph node (curved arrow). It has an irregular medial contour indicating extra-capsular tumour spread. There is a high signal central area in keeping with central nodal necrosis, though a preserved central fatty hilum may also have a similar appearance. These can be differentiated using STIR or fat suppressed images. The finding of central nodal necrosis is consistent with metastatic disease in patients with squamous cell carcinoma, irrespective of the size of the lymph node. Figure 13.13. Lymph node pitfall—reactive lymph node hyperplasia. (a) and (b) Transaxial T2W1 demonstrating enlarged left obturator and external iliac lymph nodes (straight arrows) due to infection resulting from a bladder tumour perforation with abscess formation (A). The primary tumour (T) is of different signal intensity to the hyperplastic lymph nodes. 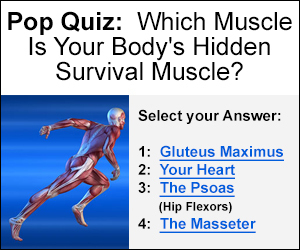 There are bilateral hydroureters (asterisk). Bladder (B). Figure 13.14. Lymph node pitfall—normal ovary. (a) and (b) Transaxial T2W1 showing normal ovaries (straight arrows) containing high signal follicles.The round ligament is identified on the right (curved arrows in (a)) as it extends towards the right ovary.There is a left obturator lymph node metastasis (arrowheads (b)).This is of abnormal signal similar to that of the primary cervical tumour (T). Of incidental note is free fluid within the Pouch of Douglas (open arrows).This could be physiological or pathological. Uterus (U). Figure 13.15. Lymph node pitfall—iliopsoas bursa. (a) Transaxial T1W1 and (b) transaxial T2W1 demonstrate a well-defined iliopsoas bursa on the left (straight arrow). The signal intensity characteristics of the bursa are in keeping with fluid content and it has a typical location posterolateral to the distal external iliac vessels. There is a beak of tissue extending from the bursa (curved arrow) towards the left hip joint, which represents the bursa's communication with the hip joint. External iliac artery (A); external iliac vein (V). Figure 13.16. Lymph node pitfall—post surgical haematoma. 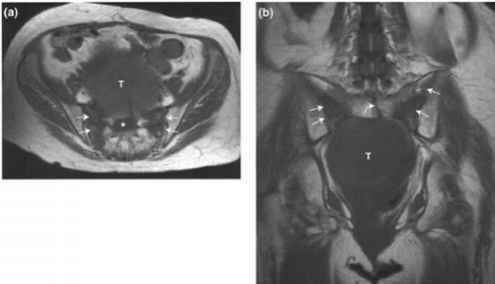 (a) Transaxial T1W1 and (b) transaxial T2W1 demonstrating a right pelvic haematoma (straight arrow) abutting a fluid collection (asterisk). On T1W1 this is of central intermediate signal due to the presence of deoxyhaemoglobin (D) with a high signal rim due to extra-cellular methaemoglobin (M), which shortens theTI. The most peripheral rim is of low signal due to the presence of haemosiderin (H). In (b) the haematoma centre is of more uniform high signal intensity with improved visualisation of the haemosiderin ring. Figure 13.17. Lymph node pitfall - right pelvic sidewall lymphocoele. (a) Transaxial T1W1 and (b) transaxial T2W1 showing a well-defined lymphocoele on the right pelvic sidewall (arrows).This is of homogeneous low signal on T1W1 and homogeneous high signal on T2W1, demonstrating its fluid content. A smaller left-sided lymphocoele is also seen (arrowheads). The patient had undergone cystectomy and pelvic lymph node resection for bladder cancer. 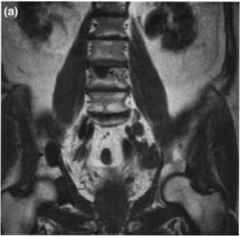 There is also metastatic infiltration of the sacrum (asterisk). Figure 13.18. Normal bone marrow—transition zone between red and yellow marrow. Coronal T1W1 showing haemopoietic red marrow in the axial skeleton, which is intermediate signal on T1W1 (straight arrow). The zone of transition to fatty yellow marrow in the proximal appendicular skeleton shows the characteristic high signal yellow marrow (curved arrows) with interposing islands of poorly demarcated intermediate signal red marrow (open arrows). Comparing left to right, this is a fairly symmetrical process and is easily differentiated from bone metastases, which would be well defined and asymmetrical. Figure 13.19. Bone metastases from prostatic carcinoma with post treatment radiotherapy change seen within the pelvis. Coronal T1W1 of the lumbar spine and pelvis. 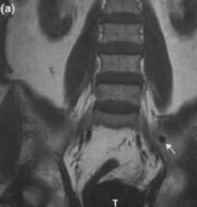 There are multiple well-defined areas of low signal seen within the lumbar vertebrae (straight arrows), which represent bone metastases from prostatic carcinoma. 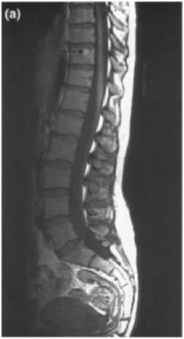 These contrast well with the intermediate to high signal of the normal adjacent vertebral bone marrow. 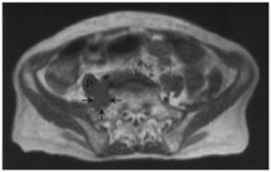 Homogeneous high signal due to radiation induced fatty marrow replacement is seen in the pelvis and femora (curved arrows). Figure 13.20. Bone metastasis from rectal cancer. 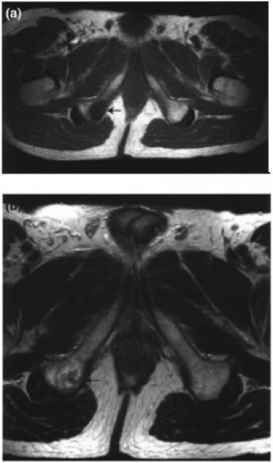 (a) Transaxial T1W1 and (b) transaxial T2W1 showing a metastasis in the right ischial tuberosity (straight arrow) in a patient with rectal cancer. The lesion appears of low signal compared to the surrounding fatty bone marrow on T1W1 in (a) and high signal on T2W1 in (b) due to the higher relative water content of the metastasis in comparison to the normal marrow. Figure 13.21. Sclerotic bone metastases in prostatic carcinoma. (a) Coronal T1W1 and (b) coronal T2W1 showing sclerotic metastases in the right hemi pelvis which are low signal on T1 and maintain reduced signal on T2W1 (straight arrows). There is a further sclerotic metastasis in the L3 vertebral body (curved arrow in (a)). Benign bone islands may have similar appearances, but these are smaller, well-defined and very low signal on both sequences. Also note the enlarged metastatic iliac lymph nodes (asterisks). Bladder (B); primary tumour (T). Figure 13.22. Bone metastases pitfall - hyperaemic marrow. (a) Coronal and (b) transaxial T1W1 demonstrate homogeneous intermediateto-low signal intensity within the vertebral marrow (straight arrows) in keeping with haemopoietic transformation of the marrow secondary to anaemia.The transformation starts within the axial skeleton and progresses peripherally but this may be patchy as in the femoral heads and greater trochanters (curved arrows) where there is still some normal high signal fatty yellow marrow.The appearances in the vertebrae may be misinterpreted as metastases, which also result in low signal on T1W1, but solid tumour metastases are usually nonuniform, discrete, asymmetrical lesions. Figure 13.23. Sacral insufficiency fractures post radiotherapy. 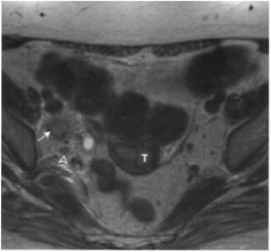 (a) Transaxial and (b) coronal T1W1 showing classical low signal vertical bands (straight arrows) through both sacral alae with an additional central sacral vertical band (curved arrow in (b)) and a transverse low signal intensity region at S1-2 level (asterisk in (a)).There is a large ovarian tumour recurrence (T). Sacral insufficiency fractures are usually vertically orientated through the sacral alae with a horizontal bridging fracture, often through the junction between 2 sacral vertebrae.This produces the 'H' or Honda sign on radionuclide imaging.The central vertical fracture is unusual and may have occurred because of the pressure effect exerted on the irradiated bone by the large pelvic tumours. Figure 13.24. 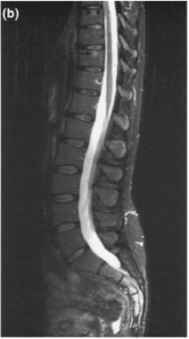 Bone metastasis pitfall- osteoporotic vertebral collapse. (a) Sagittal T1W1 and (b) sagittal STIR images demonstrate diffuse low signal throughout the T10 vertebral body on T1W1 which is high signal on STIR image (straight arrows). 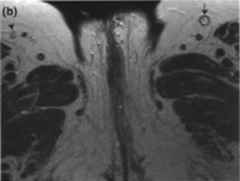 (c) Sagittal T1W1 and (d) sagittal STIR images 4 months later. There has been progression with collapse of the T10 vertebra which is now of more normal signal. A fracture through the vertebral body is apparent (arrowheads in (c)). T9 has sustained a new fracture and collapse with altered signal (curved arrows in (c) and (d)). (a) and (b) demonstrate the early features of haemorrhage and oedema in T10 followed by resolution of the marrow signal intensity abnormality but persistence of the vertebral collapse and visualisation of the fracture line, likely due to incomplete healing in (c) and (d). Also note other vertebrae at different stages of vertebral collapse, for example T12 (open arrows). Figure 13.25. Bone metastasis pitfall-haemangioma. (a) Sagittal T1W1 and (b) sagittal STIR images demonstrate a small well-defined lesion in the T10 vertebral body, which is high signal on T1W and STIR images (straight arrows). A further lesion is seen in the T8 vertebral body on the STIR image (arrowheads) also in keeping with a haemangioma. The signal on T1W1 and STIR imaging depends on the relative fat and soft tissue constituents of each lesion. Figure 13.26. Bone metastasis pitfall—benign bone island. (a) Coronal T1W1 and (b) coronal T2W1 showing a well-defined rounded lesion in the left iliac bone, which is low signal on both T1W1 and T2W1 (straight arrow). This can usually be differentiated from a non-sclerotic bone metastasis, which would be intermediate signal on T2W1, however a sclerotic metastasis may be of similar appearance. The lesion does not change over time. Note the pararectal recurrent tumour (T). Figure 13.27. Bone metastasis pitfall—subchondral cyst in degenerative joint disease. Transaxial T2W1 showing a well-defined subchondral cyst in the left acetabulum (straight arrow). This is of high signal on T2W1 indicating its fluid content. 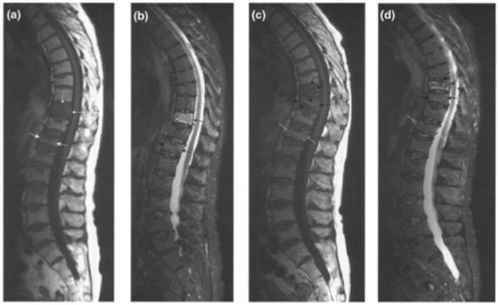 The associated subchondral sclerosis (curved arrows) and reduction in joint space all indicate degenerative joint disease. Also, note the prominent iliopsoas bursa on the left (same patient as Figure 13.15). Figure 13.28. Bone metastasis pitfall—normal nutrient foramina. (a) Transaxial T1W1, (b) transaxial T2W1 and (c) coronal T1W1 showing well defined linear or tubular structures (arrows) within both iliac wings. These extend centrally from the cortical surface, are bilaterally symmetrical and occur in this typical location within the ilium. Figure 13.29. Bone metastasis pitfall—Paget's disease. Transaxial T1W1 demonstrating diffuse low signal cortical thickening (straight arrows) of the left iliac bone in comparison with the right. The medulla is of slightly lower signal intensity due to a combination of trabecular thickening and marrow change. The latter is due to increased fibrovascular tissue which replaces yellow marrow in more active disease.